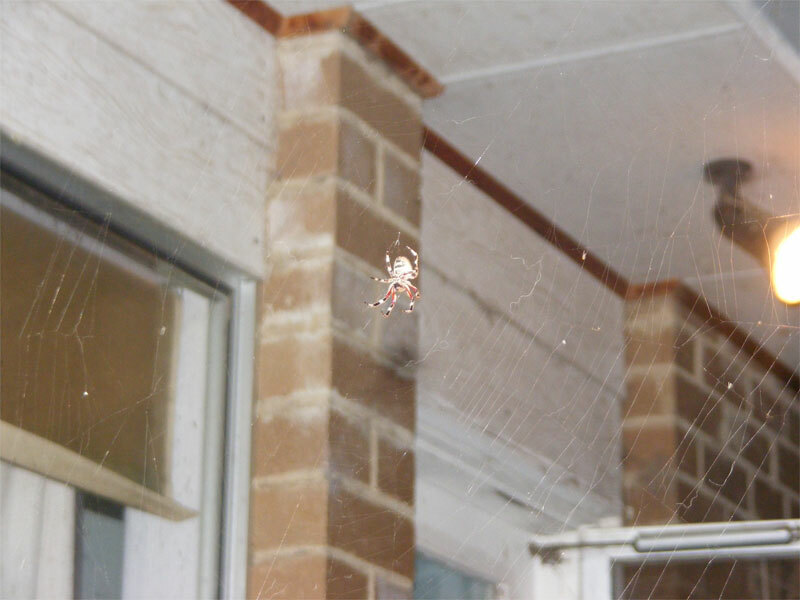 The Spiderblogger: garden orb weavers - an amazing coincidence - or is it? garden orb weavers - an amazing coincidence - or is it? At the end of my story, I will ask the question again. Is this a coincidence or the sign of something significant? I was delighted to be pointed at garden orb weaver photos on Facebook. 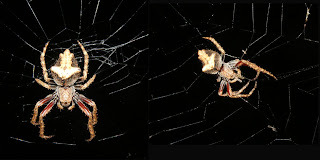 Andrew Peter had discovered a large orb weaver (Eriophora biapicata) taking advantage of the light on his back porch. She was the most typical colouring for Eriophora biapicata. He named her Regal jr., after my Regal, who has featured before on this blog. In the middle photo, Regal jr has just finished a meal. The mangled remains are to the left of her mouth. Unfortunately, Regal is no more. Her web was ruined two nights ago. The main strand was in place, but the web had been ripped - just the way it is when a night bird rips a spider from her web. I have seen it. I had a torch on one of these orb weavers watching it one night when a frogmouth (an insectivorous night bird) flew straight into the web, snatching the spider I had so generously lit up for it. I felt terrible! But I digress. Back to my story. These are clearly Eriophora, but there are strange bumps on the end of the abdomen. It cause me a shock because I had just photographed this little spider on my back porch, having never seen those humps before. Was I seeing a deformed spider? She was also a strange colour. Resting in the grouting of the brickwork, I named her Groutesque. A bit of research soon identified these spiders as Eriophora pustulosa, which is not an uncommon spider, but I have never seen one before. So is this a coincidence? Or are these spiders changing their range and becoming more common in the Melbourne area? I'd love to hear from anyone else who has noticed them, or knows anything about them. Meanwhile, Andrew and I will keep watching. 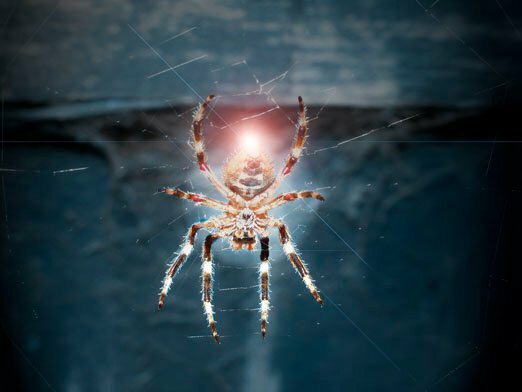 I am delighted to report that Andrew is now an addicted spider watcher, even enjoying messing aorund with his photos in Photoshop for Christmas. Isn't this gorgeous? Thank you so much to those who have been writing to me and saying how much they are enjoying the blog. I'd love to compare notes with other spider fans. So little is known about spider behaviour in the wild. Our observations may well highlight new behaviours. Thank you, Andrew, for allowing me to use your photos. I hope you will contribute to The Spiderblogger again soon. Please let me know how Regal Jr is getting on. 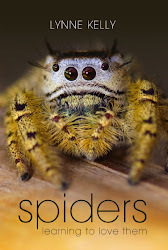 Must go now - I want to play with spider images in Photoshop! site. It wont do it if you shine a torch at 4 am. I guess it might be ready to pack up anyway. It's day camp is full of bits of old web and prey carcasses. My spiders will camp in a callistemon, an olive, or a bursaria.But never a melaleuca. I used to have about 10 garden orbs but then there was a heat wave and now there are only 2. My partner reckons they nicked off to avoid the luny with the torch. Sounds like a great idea, and terrific to have it shared here. Not a morning person, but this trick is worth getting up early for. Thank you! Must try this as I always wonder where our orb spiders go to. A big part of their mystique I must say. Over the past few weeks I've been trying to identify a spider I've been watching. I speak in the past tense as she disappeared on the weekend! She built a beautiful orb web just outside our kitchen window, in the middle of which she sat all day and night. She was there for a couple of months and never did I see her take her web down although I did see her making repairs every now and then. She had striped, graceful legs and a slender greyish abdomen. At first I thought she may be a St Andrews Cross-but she never adopted the typical cross stature. Then I thought maybe a Golden Orb? But I learned that they have a gold coloured web...hers was not. I would love to discover that actually she has gone off to make an egg sac, but I do fear for her safety! Any ideas what species she may be and if so, is her disappearance likely to be part of her natural life cycle? I do have a couple of photos of her that I took just the day before she disappeared but still don't know how to upload them to this blog. I replied to this message a week ago - but obviously I did something wrong and it didn't appear. So sorry! What you describe sounds very much like a golden orb weaver, Nephila edulis. The web really only appears golden if the sun catches fresh web. If you google for images of Nephila edulis, let me know if that matches what you saw. I have a few here, and photographed one today, so will do a blog on them. That's her! And you're never going to guess..I've been out today in the sunshine, snapping spiders and stuff in the garden and I reckon I've found a baby. I've started a blog of my own and I'm going to put some photos up there today hopefully. Check them out and feel free to use any that you wish..I've got some (not very good)of the leaf curlers too. I won't use your spider photos - just make sure I know when you have added a blog and I'll point to them. I've subscribed, but I don't get any notification of new posts on other blogs. The more we can spread the word about how much fun spiderblogging is - together we can change the world!! !